I posted this carving as a work in progress a few weeks ago and thought you might want to see the finished sign. 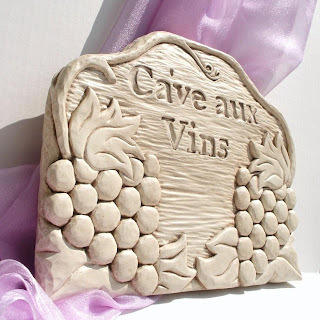 After carving, I lightly sanded this piece, painted it with 3 coats of cream milk paint, sanded lightly between each coat, laid an antiquing glaze over the entire piece, and hand rubbed most of the glaze off leaving enough in the crevices to really make the details stand out. I finished by sealing this sign with several coats of matte acrylic sealer. The milk paint has given this sign a slightly aged and crackled look that is so great! Click here to see more pics of my French Wine Cellar Sign in my Hick's Fix Shop! Hey Hick Chick! Don't you know that hillbillies "whittle"??!! Anyhoo, I LOVE your carving!! You are quite the pro! What do you have planned next? Small Team, Big Dream - Giveaway!!! A Couple New Hick's Fix Listings - Signs!